Citation Information: JCI Insight. 2019;4(1):e124643. https://doi.org/10.1172/jci.insight.124643. Obese individuals are often at risk for nonalcoholic fatty liver disease (NAFLD), insulin resistance, type 2 diabetes (T2D), and cardiovascular diseases such as angina, thereby requiring combination therapies for their comorbidities. Ranolazine is a second-line antianginal agent that also improves glycemia, and our aim was to determine whether ranolazine modifies the progression of obesity-induced NAFLD. Twelve-week-old C57BL/6J male mice were fed a low-fat or high-fat diet for 10 weeks and then treated for 30 days with either vehicle control or ranolazine (50 mg/kg via daily s.c. injection). Glycemia was monitored via glucose/pyruvate/insulin tolerance testing, whereas in vivo metabolism was assessed via indirect calorimetry. Hepatic triacylglycerol content was quantified via the Bligh and Dyer method. Consistent with previous reports, ranolazine treatment reversed obesity-induced glucose intolerance, which was associated with reduced body weight and hepatic steatosis, as well as increased hepatic pyruvate dehydrogenase (PDH) activity. Ranolazine’s actions on hepatic PDH activity may be directly mediated, as ranolazine treatment reduced PDH phosphorylation (indicative of increased PDH activity) in HepG2 cells. Therefore, in addition to mitigating angina, ranolazine also reverses NAFLD, which may contribute to its documented glucose-lowering actions, situating ranolazine as an ideal antianginal therapy for obese patients comorbid for NAFLD and T2D. 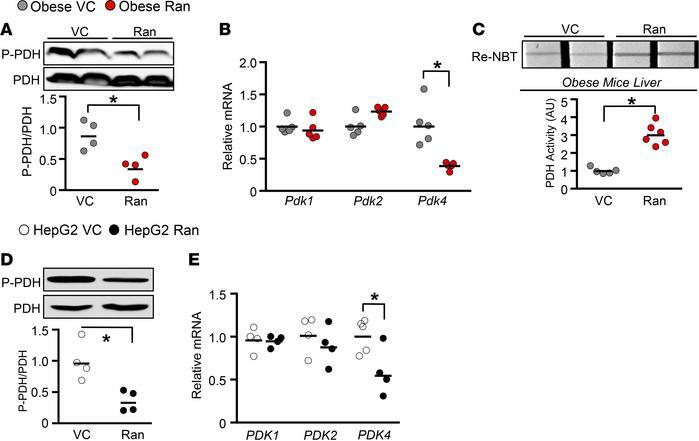 Ranolazine decreases hepatic PDH phosphorylation and Pdk4/PDK4 mRNA expression. (A) PDH phosphorylation (serine 293) in livers from obese mice treated with either vehicle control (VC) or ranolazine (Ran) for 1 week (n = 4). (B) Pdk mRNA expression in liver RNA extracts from obese mice treated with either VC or Ran for 1 week (n = 4–5). (C) PDH enzymatic activity in liver protein extracts from obese mice treated with either VC or Ran for 1 week (n = 5–6). (D) PDH phosphorylation (serine 293) in HepG2 cell treated with either VC or Ran (10 μM) (n = 4). (E) Pdk mRNA expression in HepG2 cell RNA extracts treated with either VC or Ran (10 μM) (n = 4–5). Values represent means ± SEM. Differences were determined with an unpaired, 2-tailed Student’s t test. *P < 0.05, significantly different from VC-treated counterpart.